The eight sanskrit characters represent the eight Buddhist Protectors (Senju Kannon, Kokuu Bosatsu, Monju Bosatsu, Fugen Bosatsu, Seishi Bosatsu, Dainichi Nyorai, Fudou Myoo). This is used to protect your from the evil. We can design a name or word(s) to make it look like it is written by Japanese writing brush, "Shuji." We can also scan your data and print it on a sensu/uchiwa. 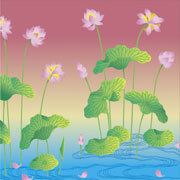 Lotus is commonly used in Buddhist art. Lotus are said to be the flower of paradise (the pure land). Kitagawa Utamaro (1753-1808) is regarded as one of the foremost painters of beauty, or the "bijinga" genre. You can design your fan with such Ukiyoe art. Asanoha is a traditional repetition pattern. This is a geometrically desigend hemp leaf pattern. First, if the token where you remain in heart is necessary, please contact us. The goods are chosen next.As for us it can deliver good ones from Japan. Leave the design to us.How many ones good plan is proposed to you.